Thank you for choosing Maine Ski Lodging Co. to book your upcoming stay in the Bethel / Sunday River area! Maine Ski Lodging Co. accepts payments made by electronic check, personal check, bank check, money order and/or credit cards. A minimum of 50% of the total balance is due upon booking the reservation and the balance is due 45 days prior to the Arrival Date. Please make checks payable to Maine Ski Lodging Co. and send to PO Box 508 Bethel, ME 04217. Please indicate on the memo line the Property you are booking. If a check is returned by the bank, for any reason, there will be a $30 service charge. Each reservation is subject to 9% Maine lodging tax and a cleaning fee. As a part of your stay, you may purchase a Vacation Rental Damage Protection plan designed to cover unintentional damages to the rental unit interior that occur during your stay provided they are disclosed to management prior to check-out. If purchased, the policy will pay a maximum benefit of $1,500.00. Any damages that exceed $1,500.00 or are not covered under the plan will be charged to the credit card on file. If, during your stay at one of our rental properties, an insured person causes any damage to real or personal property of the unit as a result of inadvertent acts or omissions, the Insurer will reimburse the Insured for the cost of repair or replacement of such property up to a maximum benefit of $1,500.00. Certain terms and conditions apply. Full details of the Vacation Rental Damage coverage are contained in the Description of Coverage or Insurance Policy www.vacationrentalinsurance.com/g20vrd. The Vacation Rental Damage plan can be purchased up to, and including at, check-in. 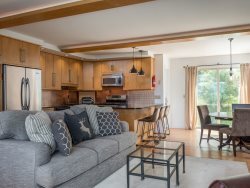 By submitting payment for this plan, you authorize and request CSA Travel Protection and Insurance Services to pay directly Maine Ski Lodging Co. any amount payable under the terms and conditions of the Vacation Rental Damage. Please contact Maine Ski Lodging Co. directly if you do not wish to participate in this assignment. In the event you do not wish to purchase this plan, a $1,500 security deposit is required in addition to a $50.00 processing fee. Reservation cancellations outside of 45 days of the Arrival Date will be refunded in full, minus a $150 cancellation fee. No refunds will be issued within 45 days of the Arrival Date unless the property is re-booked by Maine Ski Lodging Co. for the entire length of the original booking at the same total cost. Maine Ski Lodging Co. strongly encourages Renter to purchase CSA Travelers Insurance at the time of booking at a cost 7% of the total reservation balance. CSA Travelers Insurance offers the ability to cancel reservation up to the day before the Arrival Date at no additional cost. Several days prior to the Arrival Date, Maine Ski Lodging Co. will contact Renter to arrange for key pick-up and to provide any necessary instructions for checking into the Property. Check-ins may occur after 4:00pm on the Arrival Date and check-outs may occur at 10:00am or before on the Departure Date. Early check-ins or late check-outs must be previously agreed to in writing by Maine Ski Lodging Co. and may only be permitted on days where there is not a turnover at the Property. Renter responsible for booking the reservation must be 25 years of age or older and present during the entire reservation. Property is limited to the maximum occupancy stated in the reservation confirmation. For private home vacation rentals, hot tubs will be checked prior to the Arrival Date to ensure water is clean and at the correct level and temperature. In rare circumstances private home vacation rental hot tubs may malfunction and become unusable prior to the Arrival Date or during the reservation. If the private home vacation rental hot tub malfunctions prior to the Arrival Date and is not easily repairable, Maine Ski Lodging Co. will notify Renter immediately and offer one of three options: 1.) $75/night reduction in lodging 2.) transfer to another property if available 3.) full refund on all rental monies. If the private home vacation rental hot tub malfunctions during a reservation and becomes unusable, Maine Ski Lodging Co. will offer a $75/night reduction in lodging for each night of non-use. During the reservation it is Renter’s responsibility after each use, and prior to departures, to ensure water levels stay above the jets at all times and cover is securely (SNAPPED) into place and any additional supplied weights are placed on the cover. There are no scheduled hot tub cleanings during reservations for private vacation rental homes. Only Property renters may use the private hot tub. Please shower before use and do not put oils, lotions or any fragrance in the tub, as it will clog the filter and make the water dirty and cloudy. Please close lid when not in use at private vacation rental homes. Please note that the hot tub is not a swimming pool or a babysitter. We strongly recommend that children under the age of ten not enter the hot tub. If children are allowed in hot tub, they must be monitored by an adult at all times and we strongly encourage limiting their use to 20 minutes. To the best of Renters knowledge, Renter is physically sound and has medical approval by Renters doctor to participate in physical exercise activities of the type normally engaged in a voluntary for usage of a hot tub. Renter understands and agrees that Renter is responsible for learning how to use the equipment properly and safely. Should instruction be offered, Renter holds responsibility for any potential injuries that may occur. Property owner, property manager and Maine Ski Lodging Co. are not liable for any loss or damage to Renters property arising out usage of the hot tub. Renter understands that risk of injury and/or illness is present when engaging in or utilizing hot tubs and assumes all responsibility and risk of participation of this program for Renter, Renters family and all others staying at the property. IN CONSIDERATION OF THE ACCEPTANCE OF THIS AGREEMENT, THE UNDERSIGNED INTEND TO BE LEGALLY BOUND FOR MYSELF, MY HEIRS, EXECUTORS, AND ADMINISTRATORS AND DO HEREBY RELEASE ANY AND ALL SPONSORS OF THIS LODGING FACILITY AND THEIR REPRESENTATIVES, SUCCESSORS, AND ASSIGNS, FROM ANY AND ALL LIABILITY ARISING FROM INJURIES, INCLUDING ILLNESS AND DEATH, THAT MY FAMILY, GUESTS OR I MAY SUFFER AS A RESULT OF MY USAGE. MY SIGNATURE ON THIS WAIVER IS EVIDENCE I SHOULD CHECK WITH MY DOCTOR TO SEE IF HOT TUB USE IS SUITABLE FOR ME AND MY CHILD/FAMILY/GUESTS/WARD’S HEALTH AND PHYSICAL CONDITION. I HAVE CAREFULLY READ THIS AGREEMENT, RELEASE & WAIVER LIABILITY, AND I KNOW ITS CONTENTS. I HAVE VOLUNTARILY SIGNED AS MY OWN FREE ACT. BY SIGNING I ADMIT RECEIVING AND ACKOWLEDGING HOT TUB SAFETY RULES ABOVE. Two entrance keys or a unique electronic combination for the Property will be provided to Renter. Additional keys for pools, common areas and lockers will be provided as applicable. Renter will be charged a $75 lock-out fee for lock-out calls after weekdays after 6pm and on weekends. Pets are not allowed at the Property without prior written consent from Maine Ski Lodging Co. Evidence of pets at the Property will result in immediate eviction and forfeiture of all amounts paid and may result in additional cleaning fees. Property may not be sublet by Renter. Subleasing will result in immediate eviction and forfeiture of all amounts paid. Property will have a startup supply of consumables (paper towels, toilet paper, garbage bags, hand soap and dishwashing detergent etc. ), Renter is responsible to replenish this supply to their needs during their stay at their expense including propane or charcoal for properties with grills. Property beds will be made with clean sheets prior to the Arrival Date. Property includes enough towels, wash cloths, pillows and blankets to accommodate each guest. For the enjoyment of all guests and neighbors, please be courteous and aware of noise levels at all times. Fireworks are prohibited from all Maine Ski Lodging Co. managed properties and may violate local ordinances. Any police enforcement actions by the town, county or home / condo owner association may result in immediate eviction and forfeiture of all amounts paid. Maine Ski Lodging Co. and Property owner are not responsible for any reimbursements or relocation of Renter to an alternative property due to construction in the vicinity of the Property. All Maine Ski Lodging Co. managed properties are smoke free. Evidence of smoking inside the Property will result in immediate eviction and forfeiture of all amounts paid. Additional cleaning fees and anything additional needed to return the property to its original condition will be charged to Renter. Properties advertised as ski-in / ski-out are located at Sunday River Resort and are designed to be accessible by skis provided there is enough snow. Please be aware that Maine Ski Lodging Co. or Property owner cannot control snowfall amounts, natural or artificial, and if the Property is not ski-in / ski-out due to weather conditions, lack of snow or other obstruction, Maine Ski Lodging Co. is not responsible for refund on the reservation. Some driveways and roads are steep and may be difficult to travel on during the winter months and may require 4-wheel drive and/or winter tires to access the Property. Property owner contracts with independent snow removal contractors to plow and/or sand driveways after snow and ice storms at their discretion. The snow removal contractor could be delayed during a storm and Renter could be required to shovel driveway if necessary for departure. If Renter has difficulties accessing the Property, please call Maine Ski Lodging Co. and allow for a reasonable amount of time for plowing and/or sanding to be completed. Sand and shovels are provided at most properties. For properties that require permitted parking, Maine Ski Lodging Co. will provide temporary permits at the time of check-in. Renter is required to leave Property in the same general condition as found prior to the Arrival Date. It is appreciated by our cleaning staff if linens are stripped from beds and both the dishwasher and washing machine have been started if applicable. Excess cleaning fees may be charged to Renter accordingly upon departures. For private vacation rental homes, Renter is responsible for disposing of their trash during their stay. Some neighborhoods offer dumpsters on-site while others will need to bring trash to the Maine Ski Lodging Co. office dumpster located at 16 Parkway in Bethel. If at any time during your stay you have questions or concerns, please call Maine Ski Lodging Co., we’re happy to answer any questions or address any concerns you may have. Upon arrival, if Renter notices any damage to the Property, Renter is required to immediately notify Maine Ski Lodging Co. Any damage outside normal wear and tear to the Property is the responsibility of the Renter. Renter and guests of Renter will be subject to immediate eviction from the Property if they violate any terms of this agreement, including but not limited to; violation of occupancy limits, pet provision, smoking, noise disturbances or fireworks. In the event of eviction from the Property, Renter must vacate the Property immediately and forfeit any and all amounts paid. Renter and guests of Renter agree to defend, indemnify and hold harmless Maine Ski Lodging Co. and represented Property owner from and against all claims, demands, loss, liability of any kind and character, including cost of defense, arising out of or in any way connected with Renters use of the Property in the event Renter or guest of Renter suffer personal, physical, property damage, injury, or loss. Maine Ski Lodging Co. and Property owner are not responsible for lost or stolen items in or around the Property. I have fully read and agree to the terms of this agreement.